When you’re pressed for time, every minute counts — and that’s never more true than in the morning rush. Do you often find yourself scrambling to get out the door? Are you skipping breakfast or leaving late because of some unexpected delay? If so, consider starting your days with a morning routine. Establish a consistent pattern of tasks for your mornings, and you won’t have to waste time thinking about what to do next. You’ll maximize your time — so you can get more sleep, eat breakfast and get where you need to go, all without going crazy in the process. What are the keys for starting your days better? What do you need for a morning routine? Do as much as you can the night beforehand. Great mornings start with strategic evenings. Before going to bed, take care of as many tasks as you can, so there will be less to do the next day. Wash the dishes. Clean the kitchen counters. Prep tomorrow’s breakfast and pack tomorrow’s lunch. If you don’t have to shower in the morning, shower the night beforehand. Lay out your outfit for the next day. Everything that you do at night is something you won’t have to do when you’re rushing to leave in the morning. Organize your bathroom for efficiency. Organization saves time because it ensures products are where they’re supposed to be — and you don’t have to hunt for your comb, washcloth, razor or hairspray. Set up your bathroom to empower your daily habits. Group like items together (hair care products, makeup, shaving tools, etc.). Then, when you’re getting ready, everything you need will be exactly where you want it. Get a shower timer. If you don’t shower the night beforehand, you can still make sure you don’t waste time by implementing a waterproof timer. Add it to your shower and set it for your chosen time — five minutes, seven minutes, 10 minutes or whatever you want. Then, start it, get scrubbing and turn the water off when the timer sounds. Streamline your hair routine. The less you have to do to get ready, the more time you gain. As everybody knows, the notorious grooming time-sucker is hair care. Instead of washing, blow-drying and flat-ironing your long hair every morning, for example, consider using dry shampoo so that you only have to style your hair once a week. Or, switch your hairstyle so that you can simply wash and go. Ask your hairstylist for an easy, low-maintenance look. If all else fails, have a few go-to hairstyles: ponytail, a bun, a topknot, etc. Make your routine as hassle-free as possible. 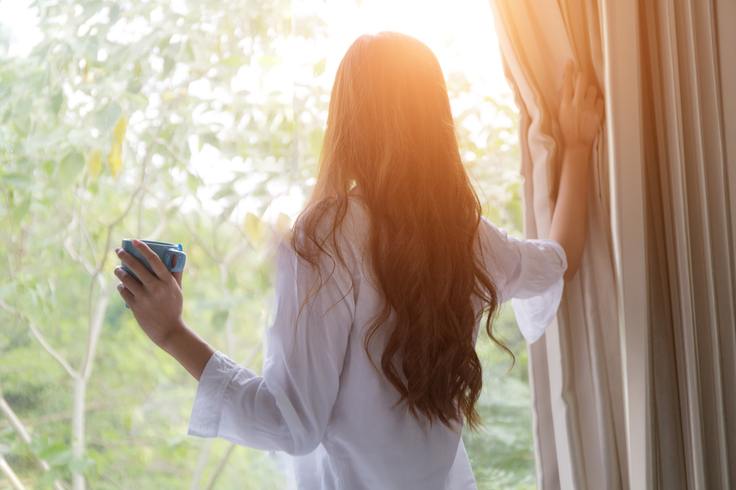 Anyone can enjoy a less stressful day with the right morning routine. For a smoother, calmer week, start practicing the above habits — and enjoy your newfound efficiency! If you haven’t heard of dry brushing yet, your life is about to change. This incredibly simple, yet often overlooked, activity is one of the easiest ways to improve the appearance of your skin, energy and more. The best part? Dry brushing is extremely affordable, requires little effort, and only takes a few minutes per day. Here’s a closer look at what dry brushing is, how to do it, and its many benefits. Unlike some other beauty treatments, dry brushing is exactly what it sounds like. You are literally brushing your skin with a dry brush. However, you need to use a specific brush — don’t just grab the regular hairbrush from your bathroom cabinet. A dry brush contains dense, semi-firm, not-too-coarse bristles that increase circulation and activate your lymphatic system as they make contact with your skin. Always brush toward your heart. The majority of the drainage of your lymphatic system drains at the nodes located in this region, so by brushing in that direction, you are moving the toxins to their exit. Use long, straight strokes, starting at your feet and working your way up. Do three to four strokes on each part of your skin before moving onto the next area — just make sure you are lifting the brush and restarting each time, so you never brush downward. Drink a large glass of water when you are done to help move the toxins. Take a shower to wash the dead skin cells that were removed. What Are the Benefits of Dry Brushing? Increases toxin removal: By stimulating your entire lymphatic system and encouraging the oxygen to transport more completely to all of your cells and tissues, your body is able to sweep away toxins and flush them out of your system. Improves skin appearance: Dry brushing can improve your skin’s appearance in many ways. First, since it is providing exfoliation, you will probably notice your skin is smoother. Because the blood flow is improved, you may also notice a decrease in skin discoloration, varicose veins and even cellulite. Additionally, dry brushing helps unclog the pores throughout your body, so the lotions and creams you use can work more effectively. Boosts energy: Who couldn’t use a little more energy in the morning? With dry brushing, you can get it. You aren’t just improving circulation to your skin, you are increasing circulation to your brain, which can help you get a little extra pep in your step for the day. As such, it is recommended to only dry brush in the morning: The energy it induces may keep you awake at night if done too late in the day. May eliminate ingrown hairs: Since dry brushing is an extremely effective exfoliant, it also helps to keep your pores clear. This can aid in reducing and/or healing ingrown hairs. Helps your body run smoother: By detoxifying your body, dry brushing makes every organ work better. After doing it for a few weeks, you will begin to notice it impacting every aspect of your life — from an improved metabolism to a rejuvenated nervous system. If you can dedicate five minutes or less every day to dry brushing, you will begin to notice many changes in both your physical appearance and well-being. Once added to your morning routine, you will never look back. Life is all about enjoying the details, and one of the often-underrated joys is enveloping yourself in a freshly washed, fluffy towel when getting out of the shower. If you stop to think about it, you realize just how important a clean towel really is — you use it every day and rely on it to do its job. Yet all too often, people continuously use old, dingy towels that are not only no longer fluffy, but could also be harboring bacteria. Here is everything you need to know about why cleaning towels is so important, how often you should be washing towels, and the signs it is time to replace those towels. Why Is Cleaning Towels Important? You use bathroom towels when your body is at its cleanest, so the last thing you want is to put bacteria right back on your skin. You wouldn’t think about rubbing the toilet brush on your freshly cleaned skin, but many towels harbor just as many germs if they are not washed regularly. This is due to the fact that they retain moisture, causing a breeding ground for bacteria every time you get dry. Not only is this unpleasant to think about, but the bacteria can lead to acne, fungal infections and rashes. If someone in the household is ill, shared, unclean towels can also spread illnesses from one person to the next. The only way to prevent this is to follow proper towel care. How Often Should I Be Washing Towels? Wash your bath towels every three or four uses. Note that you can only go this long if you are fully spreading the towel on a towel bar after use. If it is left bunched up, the moisture will not be able to fully dry and bacteria will start breeding much sooner. When washing towels, use hot water and run them through two cycles — one with just vinegar and water and another one with standard detergent. How Frequently Should I Be Replacing Towels? You have to run the towel over your body several times just to remove the water. Towel fibers inherently break down with use. If they aren’t absorbing the water as well as they once were, it’s time to say goodbye. The towel starts to smell after just one or two uses after it is washed. This is a sign there is bacteria within the fibers that is not getting cleaned properly. There are holes, tears or frayed edges on the towel. If you had a towel long enough for it to show these signs of wear, then it is undoubtedly time to replace it. Now that you know how often you should be washing towels and signs it’s time to replace them, you can be sure that you and your family are only drying with towels that will help you instead of harm you. It starts simply enough. You get a new face wash you really wanted to try. Then a few weeks later, you get some hair gel that looks great. Before you realize it, your bathroom cabinets and drawers are overflowing with items you simply don’t need. If this resonates with you, it is officially time to de-clutter your bathroom. While it may be hard throwing away perfectly good items, just think about how nice it will be to have a specific place to store every item you use. There are so many medications out there that only serve one purpose. Though once you are better, you end up with a partially used bottle in your cabinet for months. Most medications don’t have as long of a shelf life as you might think. While taking expired medications probably won’t make you sick, they will also not be as effective, so don’t waste your time with them. Go through your cabinets and throw away any over-the-counter medications that are past their expiration date. If you need to dispose of prescription medications, take them to the pharmacy so they can be discarded properly. They seem so lovely when you get them, but you already have products you know work well with your body’s chemistry, and don’t want to take any chances. You put the lovely gift set on your bathroom shelf and it sits there, collecting dust. If you aren’t going to use it, get rid of it. If it’s nice enough, re-gift it, or just give it to a friend. Most contact solution bottles come with a new contact lens case, so every time you open the bottle, you have a new case to store. They come with a new case for a reason. Switch your case every three months to make sure it is not harboring any unseen bacteria that can get into your eyes when wearing the lenses. Keep the most current case and throw the rest in the trash. When is the last time you replaced your toothbrush? If you can’t remember, it’s been too long. Replace your toothbrush every three months to help keep it clean and bacteria-free. While this isn’t exactly de-cluttering, it is a great reminder to throw out that old toothbrush and start using a new one. Hair is fickle, and commercial creators are really good at showing off what their products can do. It’s no surprise that most bathroom cupboards are laden with hair products that were purchased and only used once or twice. Now is the time to take inventory of your hair products. No matter how expensive it was or how nice the packaging is, if you don’t use it, say goodbye. Your space is much more valuable. A good rule of thumb is, if you haven’t used it in over a month, you can probably live without it. To make it a little less heartbreaking seeing all that money in the trash, donate any unopened/barely used items to a shelter. Makeup seems to pile up just as bad, if not worse, than hair products. You see an ad, want to try it, and it doesn’t work as advertised. Yet you can’t just throw the product away, so it’s tossed into your “reject” drawer in case you’ll use it someday. But someday never comes. Now, repeat this process over and over and you have quite the collection of unused makeup and nail polish. Instead of having it hog your coveted bathroom space, give it away to friends or family, or just toss it — depending on its condition. While you are cleaning out your cabinets, you may as well take inventory of your shower products. When is the last time you replaced the razor blade or loofah? May as well replace them now since the rest of your bathroom will be fresh. You may even have some shower products that you purchased that just don’t do what they promised — throw those away, too. Travel size items are ultra-convenient for traveling, especially if you hate checking bags, but that’s about it. Once your trip is over, toss any remaining travel items you have, and throw away those that are taking space now. If you insist that these travel items simplify traveling, place them in your suitcase. Now, they are out of the way, but you still have them when needed. 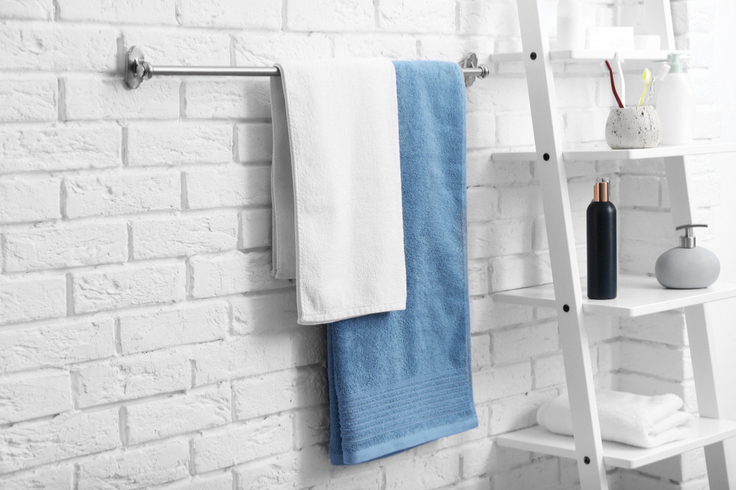 Now it’s time to discuss the biggest culprit of space in a bathroom — towels. Yes, they’re a must, but you only need two per person: one to use, and one for backup when that towel is being washed. Go through your towels and washcloths and locate the ones that are worn, raggedy or have a slight lingering odor. You can cut these old towels to use as cleaning rags or donate them to a pet shelter. What’s more, you can free an enormous amount of space in your bathroom by doing it. Toilet brushes are one of the least expensive items in your bathroom, yet they are often purchased and expected to sit there for years. Here’s the thing: toilet brushes are gross. They should be replaced at least once a year. Now the challenge is on you. 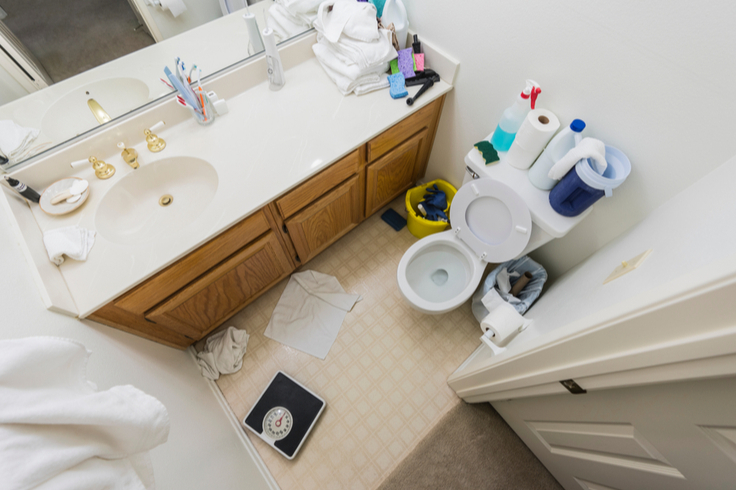 How many items can you get rid of in your bathroom? While it may seem like an enormous task upfront, it’s freeing to see all of the space-wasters go away. You will be amazed at just how much space your bathroom cabinets really have! Do you love the relaxation of a spa environment? Are you interested in making your home more of a retreat? Try turning your bathroom into an oasis by adding an essential oil diffuser to your space! The benefits of aromatherapy have long been studied, cited for everything from elevating moods to improving health. What’s especially great about essential oil diffusing in the bathroom is how it lets you set your daily routines against a backdrop of stress-relieving smells. Everything from taking a shower to brushing your teeth becomes a more enjoyable, calming experience. Are you interested in learning more about how an essential oil diffuser can make your bathroom inviting? Here’s a look at how and why essential oils work so well in this part of the home. Why Diffuse Oils in the Bathroom? When you think of everything that happens in the bathroom — showering, bathing, washing hands, brushing teeth, using the toilet — you realize how necessary this room is to daily life. That’s exactly why, because of the sheer breadth and regularity of time spent in it, it’s the perfect place to beautify. Through essential oil diffusing, you give your bathroom — and, by extension, life — several benefits. • They can purify the air. When diffused into the air, essential oils may have the ability to eradicate airborne bacteria and fungi. This means, by diffusing them regularly in the bathroom, you make it a cleaner, more inviting place. • They’re safer than candles or incense. Essential oils aren’t the only way to add aromatherapy to your bathroom, but they are one of the safest. Why? While candles are fun and romantic, they can drip wax or accidentally spill, not to mention add a fire hazard. Likewise, the scent of essential oils doesn’t cause the same headaches or allergic reactions that synthetic smells may generate. • They’re more powerful than other aromatherapy options. Both candles and incense lack the intense power of essential oils. Highly concentrated in beneficial ingredients, essential oils help you reap maximum benefits from aromatherapy at home. • Lavender oil: There’s a good reason so many bath products feature a lavender smell — it’s soothing. Diffuse lavender oil in the bathroom to enjoy a calming scent associated with better sleep and relaxation. • Sweet orange oil: To brighten the mood of a room or set an invigorating atmosphere for a busy day, sweet orange oil is a great choice. This essential oil is known to be uplifting, perfect for getting you in the right frame of mind for a day with a long to-do list. • Grapefruit or lemon oil: Thanks to their antimicrobial properties, essential oils can help ward off illness when diffused in the bathroom. Try oils such as lemon, grapefruit, tea tree or sage, all of which are especially helpful for fighting germs. 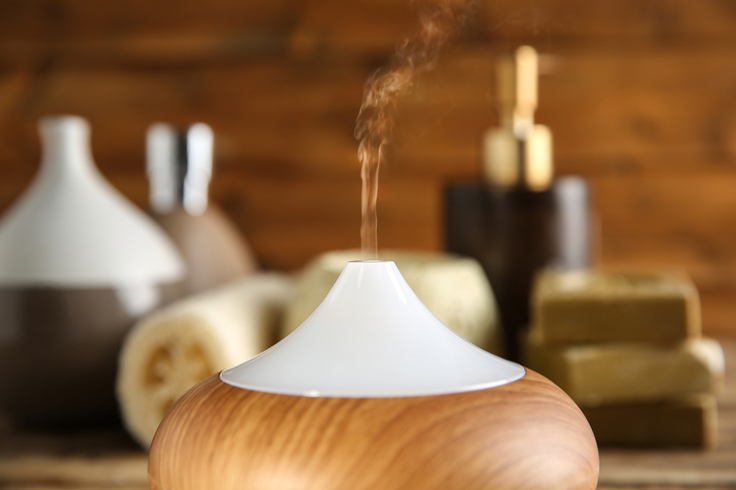 As a bonus, essential oil diffusing can sometimes offer a natural humidifier to the bathroom, depending on the type and model of diffuser you’re using. • Peppermint oil: Gear up for allergy season or soothe headaches by diffusing peppermint oil in the bathroom. In addition to this being a clarifying, anti-inflammatory scent, peppermint may help clear congestion. • Eucalyptus oil: Another great oil for clearing breathing and opening passageways is eucalyptus. This essential oil has been associated with relieving respiratory conditions and protecting you from various infections. • Ginger oil: Sore from a workout or dealing with stiff joints? Diffusing ginger oil is a great way to combat ongoing pain or discomfort. As wonderful as essential oils are, they should be used with caution. If you have pets, for example, make sure the oils you are using are safe for your furry friends. While some essential oils are perfectly fine to use in a home with animals, others are dangerous. Research particular scents before diffusing, so you can rest easy you and your loved ones are safe. From essential oils to bathroom fixtures, all the touches in a bathroom design come together to make it stand out. Are you looking to refresh or renovate your bathroom at home? Ready to set the stage for a space where you can diffuse oils each day? At Modern Bathroom, we offer factory-direct savings that help you cut costs by up to 70 percent. On top of that, we have a low-price guarantee to make sure you get the best rates every time. Shop our site to outfit your space with the best components to set the stage for bathroom elegance!